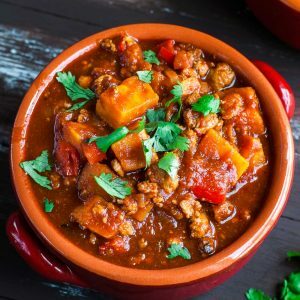 This uber easy and crazy flavorful smoky chipotle turkey and sweet potato chili recipe has both pressure cooker and stove top instructions! Below are the Instant Pot pressure cooker instructions. For stove top instructions, see blog post below. First peel and chop your sweet potato, chop your bell pepper, then peel and finely chop your shallots. Chop/mince your chipotle pepper. Measure out remaining ingredients for quick + easy chili assembly. Switch your pressure cooker to the sauté funtion and add 2 tsp oil. Sauté shallots for 3-5 minutes, until edges are golden and browned. Next add your ground turkey and cook until medium-rare and browned. Add remaining chili ingredients: sweet potato, red bell pepper, chipotle pepper in adobo, chili powder, cumin, oregano, paprika, cayenne pepper, tomato paste, crushed tomatoes, tomato sauce, and veggie broth. I saved some of the bell pepper for topping my chili, feel free to do the same if you'd like! Switch IP off, then set to HIGH for 9 minutes with lid and vent sealed. Allow 5 minutes of natural pressure release, then quick release the vent to release the remaining pressure. Allow a spoonful to cool, give it a taste, and adjust spices if needed. You may also season with salt and pepper to taste if desired. I didn't add any since my broth and tomatoes had enough salt to carry the dish. Pile on the toppings and dive on in! This chili is great right away and stellar the next day too! Recipe yields 2 large bowls or 4 smaller sides. As written, the chili is medium. Add a little less cayenne pepper for a mild cup of chili or add extra chipotle and cayenne for a spicy pot of fire! Let your tastebuds be your guide here, you can always add more at the end so play it safe with the recipe as written and then add any extras you desire afterwards. Enjoy! Feel free to adjust the consistency of the chili to your liking. As written it's perfectly thick and full of delicious texture, but can be thinned with a little broth or tomato sauce if desired! If you add a lot of extra liquid, consider amping up the spices a bit to compensate. Craving beans in your chili? Feel free to add them! A Note on Salt and Pepper :: I leave salting the dish to the end to prevent over-seasoning. Depending on the brand and type of broth, tomatoes, and beans that you use, the sodium content will vary. I used low sodium broth, regular organic canned tomatoes, and didn't salt my chili. Pressure cooker recipes always leave out the details so here's a breakdown of what you can expect time-wise: About 13 minutes to come to pressure plus 9 minutes cook time and 5 or so to release pressure. You won't need to be anywhere near your kitchen for this all to partake, the Instant Pot will handle it all! So fabulous right?